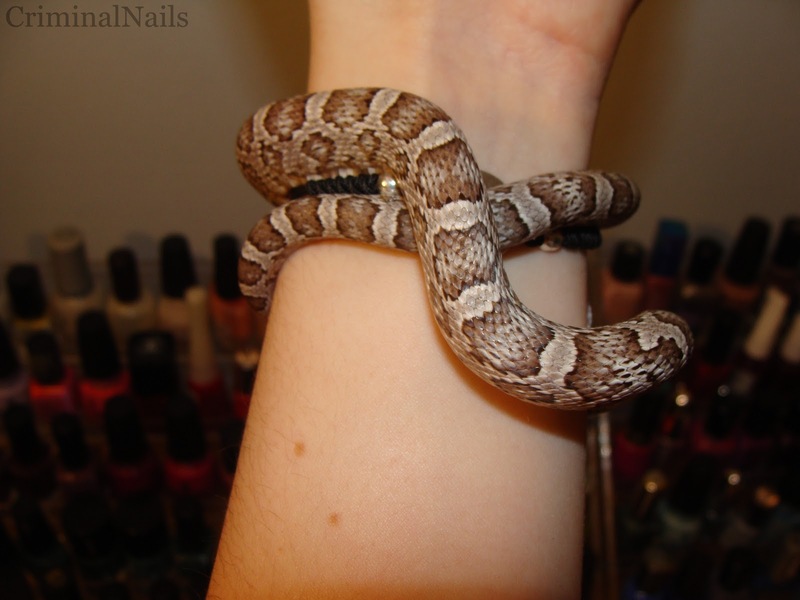 Criminal Nails: Color blocking & snake update! Color blocking & snake update! Now let me put this down in words: THIS look ROCKS (I say so myself, and shamelessly! That's how much I liked it). Went to a party with those talons, got complimented. TONS. And guess what? This is as easy peasy. 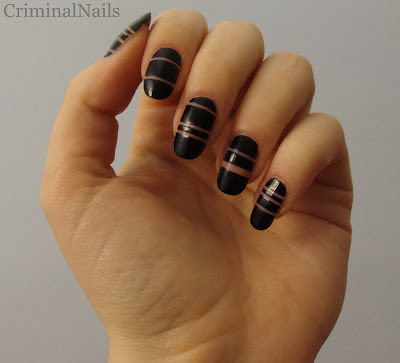 All you need is some striping tape and one color. 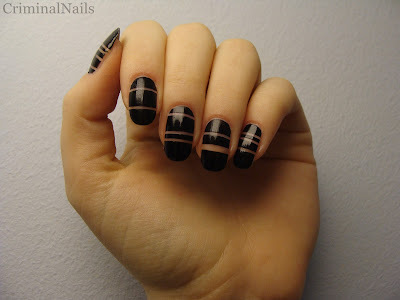 Place your tape randomly, avoid making two identical nails, paint, take off the tape and... done. Boom! Magical. Just make sure you wait some time before topcoating: you want your lines clean and perfect. That's about it. Okay, onto some SNAKE stuff (run! 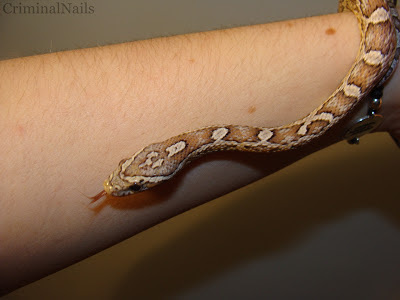 ): Discordia shed again, she's grown 10cm in about 6 weeks (I swear! I was astonished and even double checked) and she did it before my eyes. If you're not familiar with snakes, let me point this out: some people have kept the same snake for years and never watched it shed. They tend to prefer intimacy for it. But mine is open-minded, yay! The yellow is starting to peek through her neck, while her body is clearly brown, white around the saddles and grey/pastel brown on the outside. I wonder how she makes those colors look so neat and beautiful together . 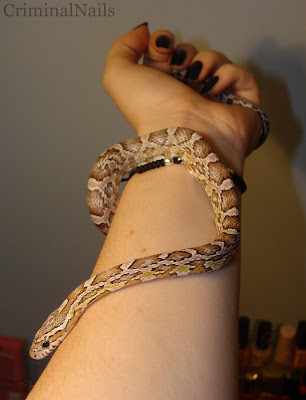 Maybe I am a weirdo, but I luuuurve this snake. Your mani looks like some tribute to Discordia!!! It's gorgeous, and so is she!!!!! No wonder you got so many compliments, this mani does ROCK!!! And damn, I remember your pictures of Discordia from before, your 'little' one grew A LOT!!! And she's so so beautiful!! WOW Discordia is growing fast - and how wonderful that you were there to see it happen! I love your mani, it's very beautiful! And yay for Discordia growing up! It's sweet that she doesn't mind you seeing her shedding. Do you know how big she'll be once she's fully grown? I used to be suggested this blog by my cousin. I'm not sure whether or not this submit is written by him as nobody else realize such certain about my trouble. You're wonderful! This article presents clear idea in favor of the new users of blogging, that genuinely how to do blogging. than that, this is great blog. An excellent read. I'll certainly be back. your web site and take the feeds also? I'm happy to search out numerous useful info right here in the publish, we need work out more techniques on this regard, thank you for sharing. . . . . .
a leisure account it. Glance advanced to far delivered agreeable from you! Hi there :) Thanks for stopping by and leaving a comment, I really value and appreciate it! I hope you enjoyed your walk through my blog, take care! I'd be more than happy to swap, review and everything in between. Rock your manicures in 3, 2, 1... GO! Pupa Holographic 033 revisited Part 1. Sensual state of mind result: DRESSES.